I just saw a news item about a new dental discount service called "brighter.com." I'm not able to see exactly how it works, but it seems to be a "dental discount plan" administered by a company. The company is clearly aiming the service toward those individuals or families that do not have dental benefits to help defray the costs of dentistry. You pay a certain amount to brighter.com and they give you a list of brighter.com dentists that will give you discounted prices on services. Membership doesn't appear to include any services, they just entitle you to discounts. You pay the dentist directly at the time of service. The service boasts that you will be able to see how much a service costs online so you can comparision shop. The plan is limited to the dentists that have signed up with them on their website. I would expect that in a larger metropolitan area you may find more dentists who have signed up. Around us (Saginaw Bay area of Michigan) the pickings appear to be limited. 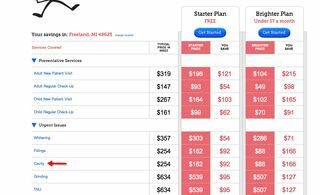 The fees listed on the site (they listed "prices typical in Freeland, MI 48623) were all over the map and didn't seem consistent with fees that I charge for procedures. They listed nonspecific procedures with a fee. For instance, they quoted a fee of $254 for a "cavity." A cavity is not a service. A cavity is a hole in the tooth created by acid from oral bacteria and dietary acids. A cavity can be small or large and can be fixed in a variety of ways. I couldn't tell you how much it would cost to restore a cavity without diagnosing the problem first. This is a business model put together by bright people who don't know all that much about dentistry. They understand that people without dental insurance are looking for discounted dental care. The concept is good. The idea of being a loyal, paying patient in return for a discount just makes sense. But why does a third party like brighter.com need to be involved? In fact, doesn't paying a third party a monthly or yearly fee add to potential costs? "Well," you say, "dentist's certainly aren't offering this kind of a discount plan." You're right…I'm not offering this kind of a discount plan. I'm offering a MUCH BETTER ONE! The Mead Family Gold Club is an excellent option for those without insurance who are interested in top notch preventive care and would like a discount on dental services. You can find the details here or just go to www.meadfamilydentalgoldclub.com. But here it is in a nutshell: for one low price you get cleanings, x-rays and exams for a whole year and a killer discount on other dental procedures. Interested? Email me at alan@meadfamilydental.com or call the office at (989) 799-9133. We'll give you all the information and get you on the road to dental health and great discounts!